The reviews and news on today's Archives announcement are starting to flood in. From Uncut.co.uk - News: "From seeing the demonstration today, and the immense space-age vision that Neil Young has for his Archives, it will certainly be worth all these years of waiting." In a meeting with a few press members following the JavaOne keynote, Young talked about the Archive project, which goes back to the late 1980s. The first stage, he said, was collecting the materials. "I am kind of a pack rat," he said, adding that over the years he's accumulated a lot of unreleased material. "I only give the record company what I want people to hear at the time. So I have a lot of unreleased material. Putting it all together tells a much different story than just what has been produced (for public consumption)." The compilation of the unpublished clips helps show Young's musical evolution, the effects of success, and the ups and downs, he said. In the beginning, he said, he was nervous and talked a lot, but was very focused on singing his songs. "I'd make a lot of jokes and then sing a tear-jerker song." Young was asked how music and technology go together. "There is a lot of math; it is emotional math," he replied. Larry Johnson, of Shakey Films (which works on all of Young's films), said Young had the concept for his latest project on paper 15 years ago. About two years ago, they put the footage all together and waited for the Blu-ray HD-DVD fight to end. "We are cramming the disc full with every feature we can," Young said. They started off envisioning it to be something like a video game, a "3D tumbling experience through time," he said. "You could see the history of the world and other great performances through time. It would be a nice thing to do. Hopefully we will get this approach done, but by the time we are halfway through, it will morph." "Putting on a headphone and listening to MP3 is like hell." "The recording business as we know it is changing. As an artist I try to remove myself from the business," Young said. "I steer myself away from that...the commerce of distributing music will work itself out." He added: "We are trying to give them quality whether they want it or not. You can degrade it as much as you want, we just don't want our name on it." People are taking music and doing whatever they want with it, he said. "The laws don't matter. These are people in their bedroom doing what they want. It's the new radio." Young said you can't be "scared or paranoid about trying to survive." Sure, when the digital revolution came along, it was "like getting hit with icepicks." Now, he said, the ice is tiny, maybe a little like snow. That said, he's clearly not a fan of MP3 quality: "Putting on a headphone and listening to MP3 is like hell," he said. Of course, digital and multitrack recordings in the '80s didn't sound so great either. The sound was shallow, he said. Now, he said, audio quality is climbing, though he still makes all his recordings in analog. "I plan to dumb my analog to the higher level so masses can enjoy it," he said. "His thoughts about the content included in his giant life collection? Blu-ray may be riddled with DRM but Young doesn't think that will be an issue. More than just indifference, Young was downright enthusiastic. 'It's up to the masses to distribute it however they want,' he said. 'The laws don't matter at that point. People sharing music in their bedrooms is the new radio.' Go Neil!" Neil Young was a personable, intelligent and well spoken interview subject. I'll remember getting the chance to interview him fondly for the rest of my life. The webcast was just totally a thrill with Neil being ... well... Neil. What else? When Young walked on the stage, he urged Schwartz to stay, saying, "I don't know what I'm doing." Schwartz moved to his side, clasped him on the shoulder, and said, "I think you do know. You are very much among friends here." Perhaps Young had witnessed the earlier live demonstrations of JavaFX, both of which froze in their tracks and needed to be restarted. "We're going to give a demo," announced Young, "and it's going to work because it's fake [recorded]." After that, he never looked back. He launched into a description of his archive project and Johnson flashed samples on the screen of early pictures, news stories, and reviews of Young's work. At one point, looking at his earlier self in fringed buckskin, Young said, "I wouldn't buy a record from that guy." Re-Broadcast of presentation Archives demo at JavaOne (begins approximately 1:15:00). 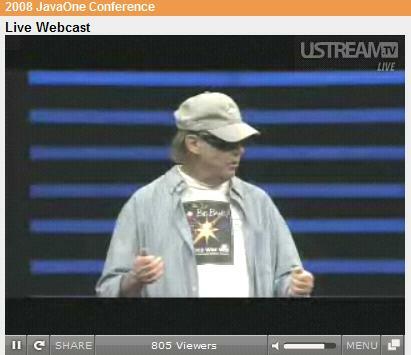 Live webcast of 2008 JavaOne Conference Keynote with Neil Young. More details of the upcoming announcement of the Archives on Blu-Ray. SAN FRANCISCO, CA JAVAONE CONFERENCE, May 6, 2008 Sun Microsystems, Inc. (NASDAQ: JAVA) today announced a collaboration with Neil Young and Reprise/Warner Bros. Records for the release of the upcoming Neil Young Archive series on Blu-ray Disc, powered by Java technology. Young will join Sun CEO and president Jonathan Schwartz and Rich Green, executive vice president for Software, on stage during the JavaOne conference opening keynote to announce this revolutionary new project and demonstrate some of the interactive features of his upcoming Blu-ray Disc box set. Visit: http://www.java.com or http://www.neilyoung.com for more information. Neil Young's exciting project ties to this year's Conference theme of "Java + You" by highlighting the role Java technology plays in delivering dynamic content, sophisticated services and application mashups across consumer devices. Today, Java technology is the most widely adopted runtime in the world and is now powering compelling content and rich end-user experiences across all the "screens of your life" on billions of devices – from desktop browsers and computers (800,000) and mobile phones (more than 2 billion) to TVs, Blu-ray Disc players and other connected consumer devices. More than 15 years in the making, the Neil Young Archive will be a complete biography of the artist's career in a timeline format including a chronology of songs released and unreleased. Through Blu-ray and Java technology, for the first time viewers will be able to navigate through Young's music, movies, videos, personal archives, memorabilia, photographs, letters, handwritten manuscripts and more while the high resolution 192/24 audio is playing, giving a chronological insight into the creative process and an opportunity to bear witness to the evolution of Neil Young's musical soul over the course of his life and work. The Blu-ray format delivers both unsurpassed 192/24 audio quality and high definition video, capturing the quality of the original analog master recordings in the best digital format available today. The first Neil Young Archive release will be a 10 Blu-ray Disc set available this fall from Reprise/Warner Bros. Records, covering Young's career from 1963-1972. "Previously, there was no way to browse archival material on a Disc and listen to a song in high resolution at the same time. The technology had not yet evolved to that capability," said Young. "It is important for me that the user experience the high resolution music along with the archival visual material. Previous technology required unacceptable quality compromises. I am glad we waited and got it right. And here is something really new, we will be able to add content to already released Blu-ray Disc archive volumes by downloading it, whether it is music, film or vintage recording sessions, recently found photographs, or other archival materials that were located after the release of that volume. Users will be able to download any of these archival materials and they will automatically be assigned to their place in the Chronology timeline." "The Blu-ray format offers superior audio and video quality and, through Java technology, gives the viewer sophisticated ways of interacting with the content. Sun is thrilled to be working with Neil Young on what will surely be the most innovative release of any artist's material and the start of a new genre of content," said Schwartz. "Through Blu-ray and Java technology, the Neil Young Archive will create a more immersive experience for the viewer and a truly unique experience for his millions of fans around the world." Java technology, which is the underlying platform for the new BD-Live capabilities of the Blu-ray format, enables interactive components as well as the ability to update all aspects of a Blu-ray Disc via BD-Live Internet connectivity. For the Neil Young Archive discs this could potentially include content updates such as music, film, adding new photos and providing tour information. It could also provide the ability to support dynamic fan community features such as message boards, concert reviews or even enable fans to use a BD-Live donation mechanism to help support the Bridge School (http://www.bridgeschool.org/). The Bridge School is a non-profit organization whose mission is to ensure that individuals with severe speech and physical impairments achieve full participation in their communities through the use of augmentative and alternative means of communication and assistive technology applications. 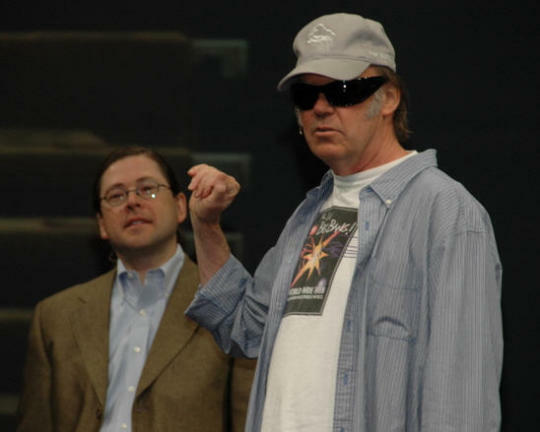 java.com will be featuring the work with Neil Young and the archive project in a special Java + Neil Young segment. 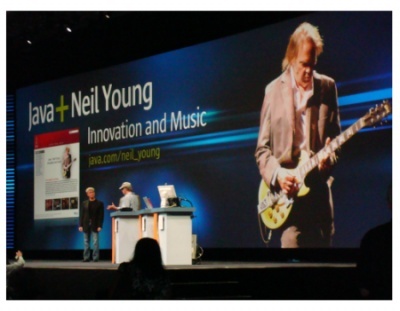 Java + Neil Young will include links to Young's appearance at JavaOne, as well as links to more information about the upcoming Blu-ray Disc package. i had no idea he could breakdance like that. did neil go on yet? Sun Green is a 19 year old woman. Rich Green is her uncle and he's Executive Vise President Software for Sun Microsystems. Sun Microsystems got their name from Sun Green. That's why they invited Neil, because Neil created Sun Green. http://www.java.com or http://www.neilyoung.com for more information. players and other connected consumer devices. course of his life and work. analog master recordings in the best digital format available today. be assigned to their place in the Chronology timeline." unique experience for his millions of fans around the world." communication and assistive technology applications. links to more information about the upcoming Blu-ray Disc package. The first Neil Young Archive release will be a 10 Blu-ray Disc set available this fall from Reprise/Warner Bros. Records, covering Young's career from 1963-1972. 1. Will I be able to listen to the music without all the visuals? This is important to me. The visuals are cool, but ultimately are ancillary. I wanna wake up on a sunday morning and listen to the music without "interactivity". 2. How much $ is this gonna set me back? 10 Blu-rays ain't gonna be cheap. Doesn't seem like the right economic climate to be releasing something so expensive that requires the purchase of new equipment for many fans, not to mention that this is going to be too complicated for many people to navigate. I'll bet Warners is worried. I've been a huge fan since the early 70's and I'm going to have to pass on this investment that Neil is asking me to make on his behalf. In the presentation, Neil seems to think every home in America has a PS3. I do not. The cheapest Blu-Ray players cost $400. The Archives Vol.1 will certainly cost more than that. I've been jonesing for this material for years, but I ain't gonna shell out more than a grand for it. I hope he releases a music-only version on vinyl. Of course, that would take up 20 LPs, but I'd pay $200 for a 20 LP version of the Archives vol 1. I ONLY want to hear Neil...can you post ONLY the URL of Neil Young Webcast??? Neil will probably release it on dvd-audio too. Also, iTunes might release it. I am extemely pleased to see that Neil will deliver the Archives in the best format available on the market -- in a groundbreaking manner. I remember thinking that the three-record Decade was new turf - in it's own way. Made it special. Heck, if he had waited any longer, we might be able to completely relive the NY experience, through a holographic trip down memory lane.. in which you, the viewer, ride alongside Neil in ol' Mort while he jumps out on Sunset Blvd to flag down Stills, all the while listening to "The Sultan"... next, you find yourself trapped in the ranch staring down an angry Charles Manson and wondering why he has the Revolution Blues, only to then be transported to the Hammersmith Odeon to have the wind flow through your mane while riding on the high of an extended Hurricane solo... Maybe Neil should wait until we enter that technological realm... I bet Apple will have it out in a year or two. An archive isn't created to be viewed in one or two sittings. It is an experience as much as the lifetime it took to create it. You'll be ready for blue ray technology when you're ready. Neil's music has been the soundtrack to my life since 1973 when my cousin lent me After the Goldrush. In 1974 I hitched up to London to see CSNY. £3 for the ticket. Last year I flew to Toronto to see the Massey Hall concerts. $500 for the first night ticket. I don't know what blu ray is. Java? Isn't that a kind of coffee? Anyway, just like no one had to pay that stupid money for a ticket to see a Chrome Dreams gig no one has to buy a bluray machine whatever it is but just like I bet no one who was in Massey Hall last November regrets the cost I bet no one who invests in this archive thing / stuff will regret it. Neil cares about quality of audio and vusal experience who can deliver for the Archives, which is why he wants to go with Bluray. He also knows that down the track it will somehow end up on the web via free download from some blog. People who don't wish to change to Bluray will be able to get copies in lesser quality formats. He doesn't care about that. Technology changes, this will always be the case and has always been the case. "People who don't wish to change to Bluray will be able to get copies in lesser quality formats. He doesn't care about that."